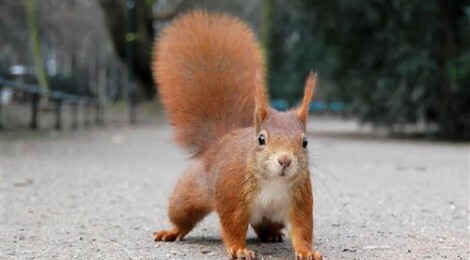 I like squirrels. I think they are cute. Bushy backside, collecting nuts. I don’t experience them as rodents with long tails like some people do (which they probably are). Squirrels seem to be hardworking and playful to me. However, there is one situation in which squirrels get on my sweet, stubborn, southern, ever-lovin’, last nerve. It is when one is trying to cross the street in front of my vehicle. I mean, bless its heart. We do a dance that happens rapidly and with more dance steps and mixed signals than you see at a four way stop. I never know how it is going to end. The lack of control is terrifying and traumatic. I see the squirrel in the middle of the road. Oh, how cute. Go ahead, little guy! I might even wave my hand to let him know I am friendly and can be trusted. I slow down, but since I have cars behind me I choose not to come to a complete stop. There is plenty of time for the squirrel to get across. It is at this point in the dance when the squirrel does that thing. It stands up on its back legs and looks at me. Go ahead, cutie! It’s ok! It continues to stare and jerks a bit as if trying to fake me out. I slow down some more and my heart rate goes up. Oh, dear Lord. Am I about to run over a squirrel?!? It darts left then right. Get off the road, dammit! Listen, little rat, you are about to lose your cute factor and become a splat on the road! I keep going and feel sick to my stomach as I brace myself for the thud I am about to hear as my tires go over the infuriatingly, stupid, indecisive, skittish creature. I let out a breath I didn’t realize I was holding. I feel my body start to relax. I begin to cry from the trauma of it all. Sometimes there IS a thud. It happens. It does. And, I drive on to my destination carrying the shame of murder on my soul. Why? WHY?! Why couldn’t you just make up your mind, stupid squirrel? Why couldn’t you just make a decision? Your anxiety and indecisiveness is really at fault. Not me! Not me, stupid squirrel. This wasn’t my fault. You put me through seconds of terror with your inability to commit. That’s all you had to do! I gave you plenty of time. You just had to make a decision and go with it. Either side looked good to me. Just make a decision already. Sigh. We aren’t much better, are we? The other day I was driving behind a car, trying to get onto the interstate. I almost had a wreck as I couldn’t figure out which way the car in front of me was going to take. As we made our way to the on-ramp, it continued to straddle the dotted line between two lanes. Every so often the car would veer as if it were going to commit to one lane over the other, but then it would skittishly reorient itself to the dangerous middle ground. What in the world? Are you confused? New to the area? Not sure where you want to go? The ironic piece to this picture is that both lanes were heading to the interstate. And, no, the behavior did not seem to be due to intoxication, although you can never be completely sure about that. Also, it was lunchtime on a weekday. Not that the time always matters when it comes to choosing to drive and drive, unfortunately. I was genuinely afraid the driver of the car was putting him or herself (and others) at risk because of his or her own skittishness and uncertainty. Eventually, the driver found clarity, made a choice, and we each found our way forward. Has this situation ever happened to you? If not with a squirrel or a car in front of you, maybe in real life? Were you the squirrel? Or, were you in the car trying to let the squirrel get across to the other side? Getting across to the other side of things, making decisions, initiating big changes…all super scary. These things call for some hesitation. Demand it, even. Fear, anxiety, weighing options, looking at the danger (or car) dead in the eye for a moment before committing…all normal. NOT to stop, look both ways, and consider the costs would be folly. A lack of wisdom. A sign of immaturity and a lack of impulse control. But, friend? May I suggest something? It isn’t the transition, decision or change that is causing you as much danger as you think it is. Your dangerous straddling of the middle ground. Your anxiety both causes and is perpetuated by this space…this middle of the road space where you are soon to become a splat on the pavement…as well as cause harm to those following you. I am sure it is a BIG deal. I am sure it is scary. I am sure your life is about to change. I am also sure that you can be ok. No matter what. I don’t have a crystal ball to see the future or a magic wand to create certainty, but I do know something about the survival instincts and resiliency of human beings. For you religious types out there. I love you. You are my people. But, listen, friend. LISTEN. You have got to stop allowing your image of God to jam you up into misery. Sometimes, I wonder if God, too, is waiting patiently for you to cross the street…patiently waiting to know which direction or decision you choose so the Spirit can get back to working alongside of you on crafting this gorgeous, complex story known as your life. Stupid squirrel. I have been stupid, too. Anxious. Perfectionistic. Indecisive. Skittish. Fearful. Paralyzed by the pressure of actually taking responsibility for my life. And, me being squirrelly? It hurt myself as well others around me. Don’t be squirrelly, friend. You are much too cute and playful and hardworking for that business. Nope. No crystal ball here. No magic wand either, but you know what? I do know one thing. No matter which side you choose? No matter which direction you take? God will be there. I really needed to hear this today. And I love the anology too. Thanks for sharing this with us. Awe, I’m so glad it was helpful. Love and miss you! I am currently the squirrel! Thanks for this reminder to stay focused on the path that God has us on and not trust in my anxieties and fears about the future. You are hilarious in your description of the squirrel I love it! !